For many years Jewish young and not-so-young individuals have been affected by, and felt the need to respond to, many issues. Some of them were personal – domestic abuse and divorce, mental and physical healthcare, drugs and alcohol abuse, the role of women in society, public school education and childcare, support and assistance for elderly parents and family members, isolation and alienation and careers and employment, ways to celebrate Jewish holidays and life-cycle events such as a Bar/t Mitzvah. Some community issues affected them but more indirectly: i.e., poverty, discrimination against blacks and minorities; environmental protection; unavailable decent, safe and sanitary housing; homelessness; hunger, immigration and vehicles for making charitable contributions. Other issues were global but not necessarily of less concern – the war in Iraq and the continuing conflict in Israel/Palestine. Far too many have, for a variety of reasons, decided that Judaism is irrelevant to the search for solutions to these problems and no longer consider themselves Jewish. Over half of all Jewish individuals intermarry and, of these, fewer than half raise their children Jewish. Our efforts are based on the belief that through an examination of the moral and ethical teachings of Judaism, you will become familiar with values, laws and principles; will apply them as you address your concerns, be they personal (family and work), community (local and national) or global (Iraq and Israel/Palestine); and will then appreciate how relevant and meaningful Judaism can be. 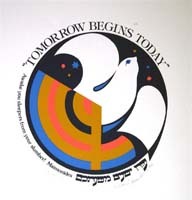 We want to acknowledge our appreciation to Saul Zalesne and Emes Editions Limited for giving us permission to use the beautiful artwork by Mordechai Rosenstein on this website. If you are interesting in seeing more of his works and possibly purchasing them, visit Emes Editions Limited.